The average score for students taking the venerable SAT exam in 2014-2015 was 1490, seven points below last year’s scores and the lowest score since the writing section was added in 2005. Not surprisingly, this drop is generating a lot of media coverage—much of it focused on how high schools are failing America’s children. But while high schools may very well be a concern (and those of us in colleges shouldn’t get off without criticism, either), I contend that the decline in SAT scores may be just fine. The simple reason for my lack of concern is that the decline may very well be due to more students taking the exams in response to new state laws and district rules in several states requiring or encouraging testing. For example, Idaho required beginning in 2012 that students had to take the ACT or SAT to graduate—and that the state would cover SAT costs for students. In 2011-2012, 27% of Idaho students took the SAT and got an average score of 1613, while practically all Idaho students in 2014-2015 took the SAT and got an average score of 1372. (The District of Columbia, Delaware, and Maine—the other three jurisdictions where basically everyone takes the SAT—had similarly low scores.) Either Idaho high schools imploded over a three-year window, or the types of students who weren’t previously taking the test didn’t have the same level of ability on standardized tests as the 27% of students who were likely considering selective four-year colleges. 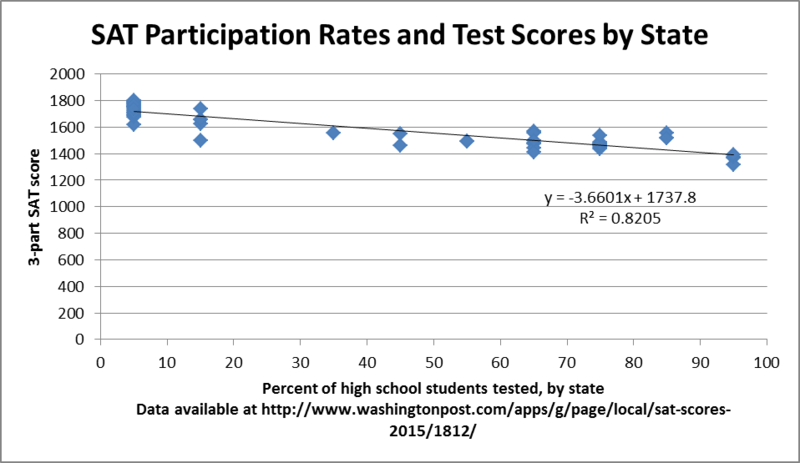 The chart below shows the relationship between the percentage of students taking the SAT and scores (data available via the Washington Post). The R-squared is 0.82, suggesting that 82% of the variation in state-level test scores can be explained by the percentage of students tested in each state. What I would like to see is some comparisons across similar types of students over time. Among students who signal a clear intent to go to a four-year college, are SAT scores declining? Or is the entire decline driven by different students taking the test? And are students considering college for the first time because they took the SAT and did reasonably well? There is value to everyone taking a standardized test across states (given the differences in state high school exams), but it’s inappropriate to look at trends over time with such large differences in the types of students taking the test. Thanks for sharing! I remember reading that piece a while back, and it’s good to note the benefits of requiring the test. Previous Previous post: Who Would Use Income Share Agreements to Pay for College? Next Next post: Do SAT-Mandatory States Explain Declining Scores?